I'm a big fan of this story, always have been & I suspect I always will be. Chris Boucher, who wrote the rather excellent 'Robots of Death', has created another pretty good story. It's not quite as wonderful as 'Robots' but I'll put that down entirely to the slightly pointless trip to the Fifth Planet in episode three, which is essentially pure padding. Nonetheless I love this story. It feels like a real horror story. With a bit of editing & the cliff-hangers removed it would make a nice British horror flick. The strong cast - Denis Lil as Fendelmen; the gorgeous Wanda Ventham as Thea; Edward Arthur as Adam Colby; Scott Fredericks as Max Stael (who is the megalomaniac lunatic of the week); Geoffrey Hinsliff as Jack Tyler... oh and please be upstanding to give a bumper round of applause to Daphne Heard as Ma Tyler. It is one of my favourite ever performances in Doctor Who. Whilst the accent might be pure Mummerset the performance is so good you find yourself wanting more scenes with her in. It's a gem. 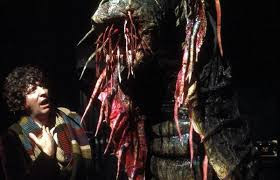 Fendahl is unusual as Doctor Who in that a lot of scenes don't involve the Doctor or Leela at all. Instead it is the guest stars play off of each other driving both drama & plot. It feels unlike a Doctor Who story at all in some ways. Everyone but Colby also gets a moment when the horror of what is happening - or might be about to happen - dawns on them. Thea, when talking to Adam in the lab; Doctor Fendelman when he tries to persuade Max & Co not to go through with their actions & Max himself when he asks the Doctor to pass him the gun. For Fendelman & Max this realisation ends in their deaths. For Thea there is a different fate. She gets to flit around painted gold turning people into Fendahleen. I'm not sure whether the Fendahleen work or not. I remember as a six year old being absolutely terrified with the cliff-hanger to Episode Three but it looks less terrifying now. This I'm going to put down to old age & cynicism. It perhaps needed to be a wee bit slimier. This is the classic example of the fear coming more from anticipation & hints than the final sight of the creature. Even now though it didn't really effect my enjoyment of the story, which is anchored in the acting & the words rather than special effects. In fact as I've worked my way through these stories it slowly dawns on me that it is the performances & the words that have always been the appeal to me of Doctor Who. There might be a lot of technobabble & futurebabble. There might be occasional moments of blandness & stupidity but if you get a script with intelligence & wit combined with actors who deliver on the performance front, even when faced with the silliest & stupidest special effects then you get something wonderful. The special effects have never really mattered. It's nice when they're done right & when they look great but it was never about that. It's about the Doctor & his friends saving the Universe with wit, charm, style & the minimum amount of violence necessary. I should also pay homage to Tom Baker & Louise Jameson again. Tom's great when displaying what I can only describe as intellectual power. Taking control of a situation through words & explanations. Making people listen to him by force of character alone. Louise Jameson does a great job of keeping Leela from becoming a cipher. There's some lovely scenes between the two of them throughout. It's a nice Doctor & Companion relationship & it is a shame it wasn't to last much longer. So minor quibbles aside I love this story. It's one of the handful of stories that I watched as a child that I can still watch now with that childish spirit.